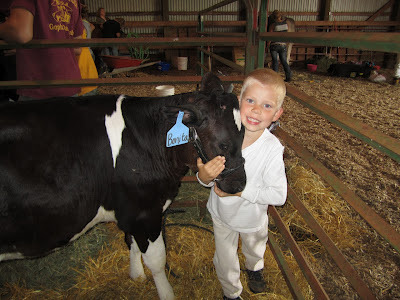 The Stearns County Fair was last week and now that it's over, so is our family's first ever show season. The season started with the selection of calves. With a little guidance from us, Dan picked a March Holstein calf named Bonita for his show calf. 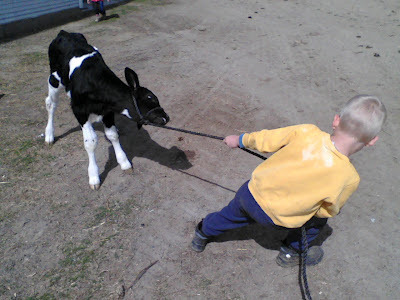 Monika decided she wanted to take three calves to the fair — Star (aka Rockstar), Sandy, and Cookie. Dan and I took Bonita out for a walk one nice April afternoon. 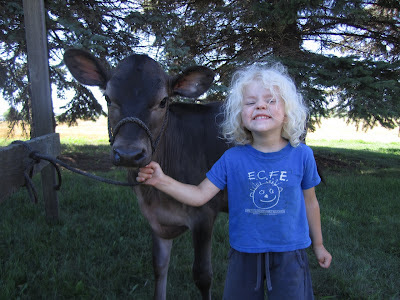 Dan didn't let go of the halter when Bonita went from stubborn to wild, but he ended up with grass stains in his hair. After that, I changed our strategy. We tied Bonita up in the calf pen so she could get used to the halter while Dan brushed her. Dan even managed to trap her in the feeder stall one time all by himself so he could brush her there. We did that for quite awhile before we took her outside again. 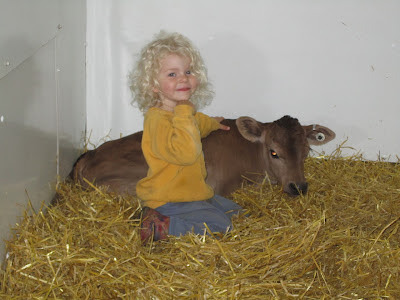 Monika was mostly content to socialize her calves by simply hanging out with them. 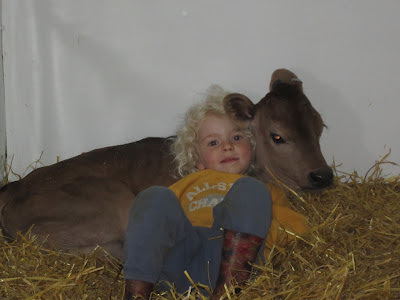 She's hanging out with Star, an April Jersey calf, in the photo above. Our first ever show was the Central Minnesota Youth Dairy Days show on June 15. Our goal was for this show to be a learning experience and an opportunity for Dan and Monika to see what showing is all about. Dan and Bonita got third place in their class. 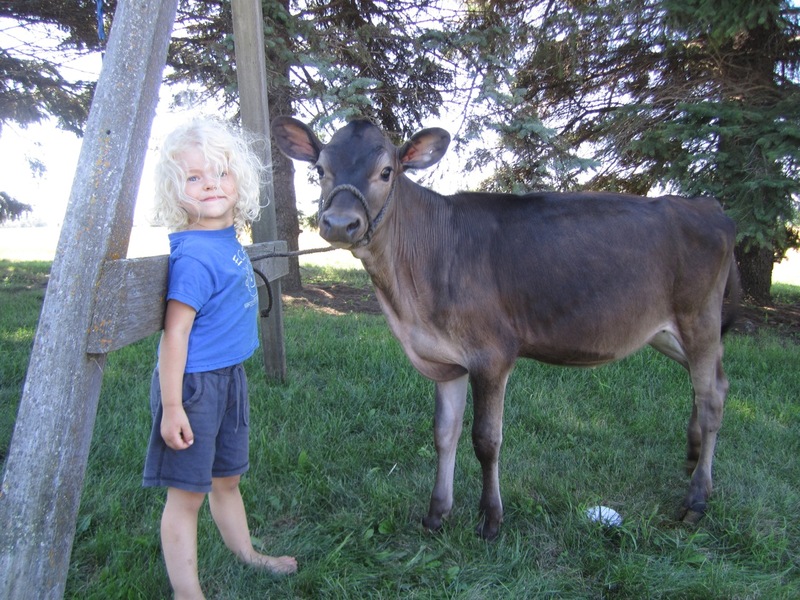 Monika took Sandy, a May Jersey calf, to the Dairy Days show and they got third place in their class, as well. 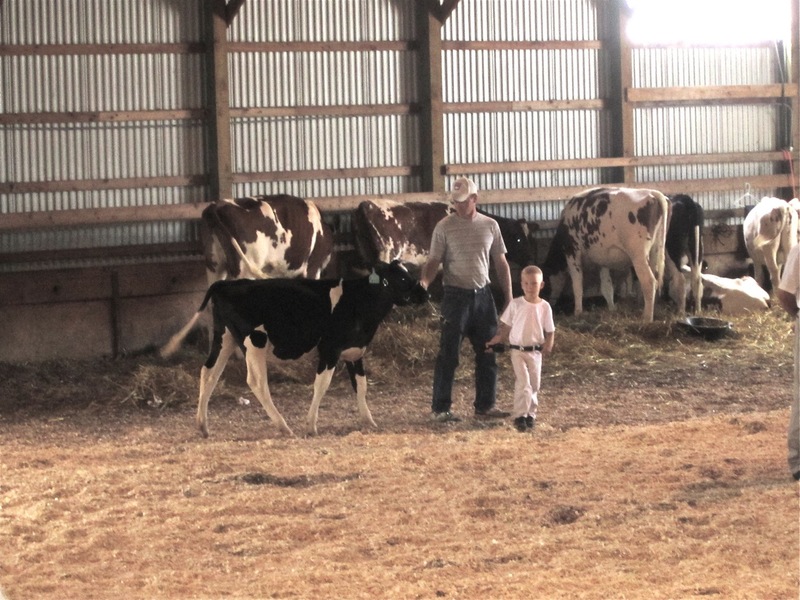 The show was a bit long for both kids' attention spans, but after watching senior showmanship, Dan told me he was going to lead Bonita every day so that she would walk nice. We didn't lead Bonita every day, but she led very well at the Stearns County Fair, especially considering that she comes from a line of remarkably high-strung cattle. Dan practiced saying Bonita's name, birthday and sire so that he could tell the judge when he asked. Monika and Star did very well, too, but we didn't get any good pictures in the show ring. 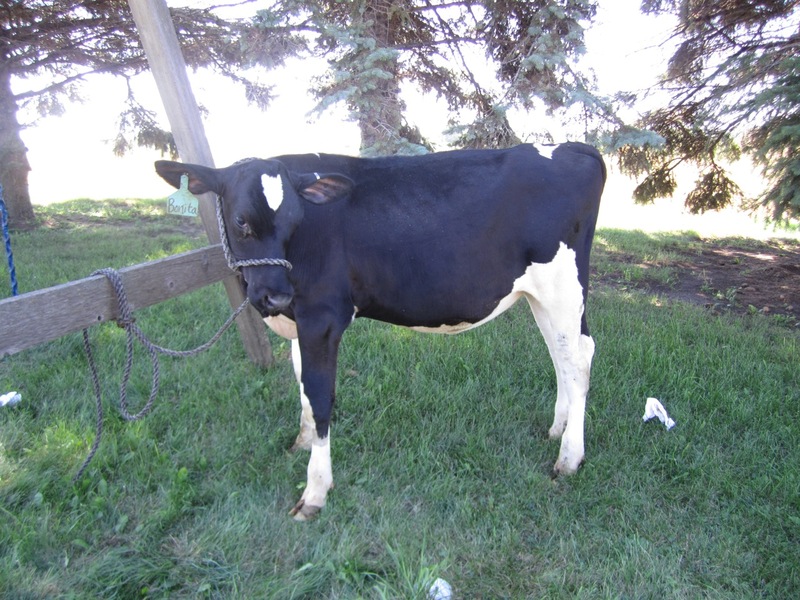 Bonita was the first place spring Holstein calf in the Open Show at the Stearns County Fair. Star was the first place spring Jersey calf. I'm not sure if Dan and Monika understand how special that is, but we (Mom and Dad) are pretty darn proud. We debated taking Bonita and Star back out for the Junior Champion line-up, because Glen said baby calves never get picked for higher honors. I decided we should take them back out because it would show good sportsmanship. 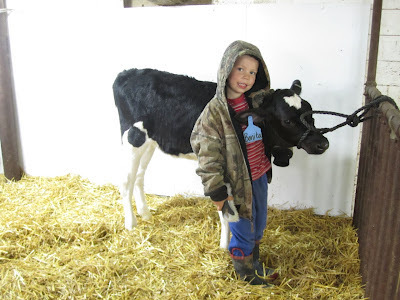 Plus, who knows when we'll have a first or second place calf again. 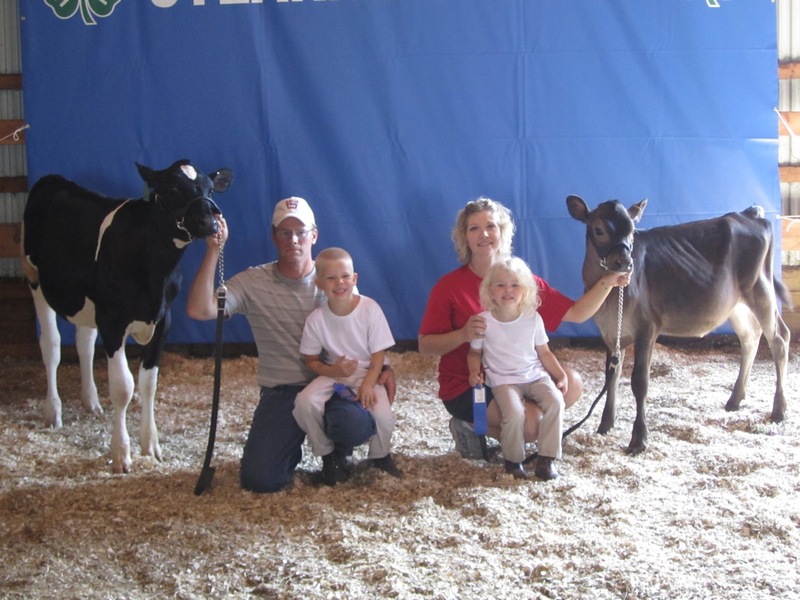 As Glen predicted, older Holstein heifers were selected for junior champion honors, but then, the unthinkable happened. In the Jersey Junior Champion line-up, the judge pulled Star and two older heifers out for top honors. I could hardly believe it and figured Star didn't have a chance against the other two. 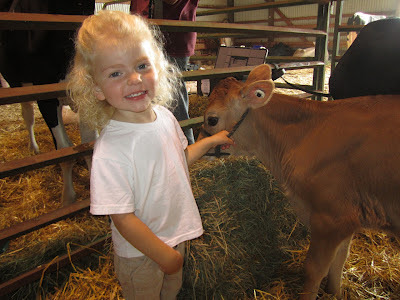 But she was named Jersey Reserve Junior Champion and also Top Bred & Owned Jersey of the show. Monika definitely doesn't understand how incredibly well Star did, but she was beyond excited about getting a purple and a pink ribbon. She even wanted to take the ribbons along on the fair rides after we were done with the show. My camera died right before the junior champion line-ups. I used my phone to take the picture of Monika with her ribbons so we could send it to Glen, since he had gone home to finish cutting third crop. But I got the dead battery to take one last picture of Monika at the fair. 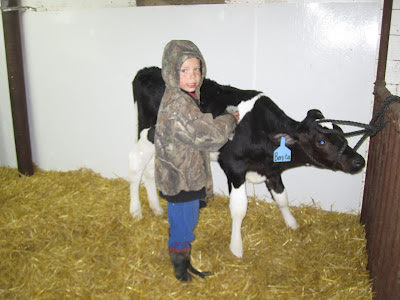 Showing calves is hard work for a three-year-old. 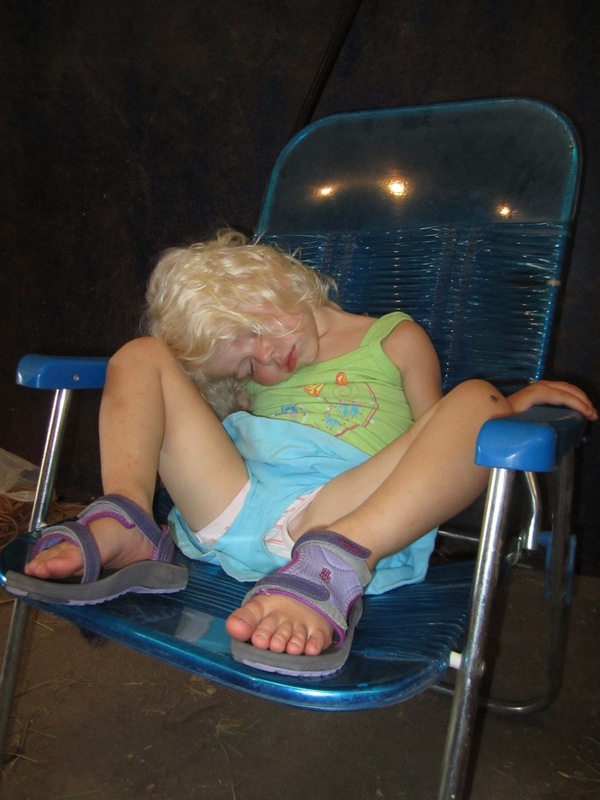 She sat down in this lawn chair by her uncle's horses while I was loading the trailer and promptly fell asleep. Since my camera died at the show — and it was just a bit crazy there — I took a couple last photos of the kids and their calves together before we put Bonita and Star back in their pens. Our first show season was fun and rewarding. We're looking forward to many more. Way to go! Looks like you all had a lot of fun! I love this post! 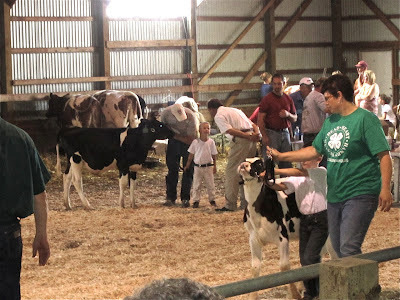 We just finished our county fair open show today. 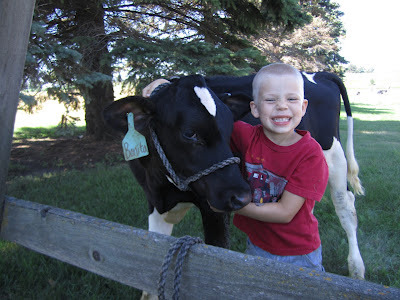 Our 5 year old and 3 year old have been working with their calves all summer. 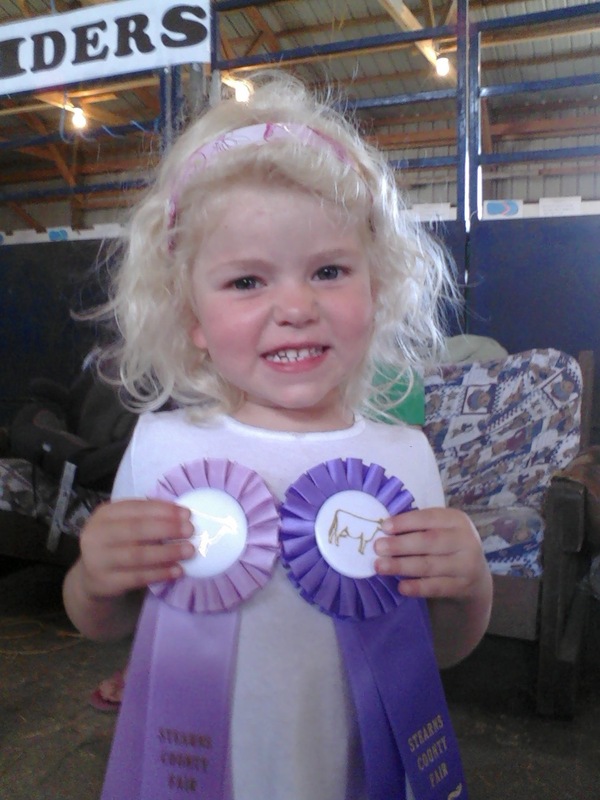 Way to go on all the ribbons! !